Sanders Theater filled with an audience perhaps warming up for for the Super Bowl at the latest Boston Early Music Festival offering. Jordi Savall returned to Boston at the helm of a seven-member version of his ensemble, Hespèrion XXI, delivering assorted Renaissance and Baroque dance music stretching over two centuries with a characteristic mix of meticulous research and exemplary execution. Within an ensemble of five viols, Savall played the highest treble from the furthest left, with Imke David on tenor next to him. 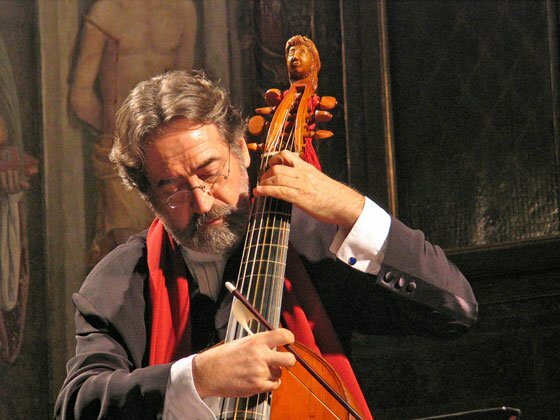 Xavier Diaz-Latorre was in the middle of the group with his theorbo and a double-strung guitar (looking and sounding like a cross between an Arabian oud and the acoustic instrument familiar from pop music). Two early music conductors sat on the right, Lorenz Duftschmid (director of Armonico Tribute Austria) with a cello-sized bass viol, and on the far right, Philippe Pierlot (leader of the Ricercar Consort) on bass viol and viola-sized alto viol. Behind the violists, David Mayoral played an array of percussion instruments, and Xavier Puertas stood with a double-bass sized violone. The program explored the ways that Venetian innovations in instrumental music echoed and rippled through Western Europe between 1500 and 1700. Savall broke down a daunting list of instrumental dance music into eight sets of three to five pieces. The musical journey began in Venice around 1500, exploring dance music with an anonymous Pavana and Galliarda, an anonymous Saltarello, and a Hungaresca by Giorgio Mainerio. The stately dances flowed one into another without a break, making it a little tricky to tell one piece from the next, but the rhythmic drive imparted by Mayoral on tambourine and drums showed their clear ties to dance music from court. The viol parts were homophonic, mostly moving in exact parallel, though the Hungaresca had more of a bagpipe-like drone underlying it. The mid-to-late 1500’s featured Ricercar forms by Hieronymus Parabosco and Andrea Gabrieli, and a Capriccio by Giovanni Battista Grillo. These works had more contrapuntal complexity and less driven rhythm, with textures that sound like the kind of vocal polyphony that I’m accustomed to from church music. The Gabrieli featured nifty duetting between Savall and David, then a triple time refrain, then a duet between Duftschmid and Pierrot. The Grillo had some rhythmically challenging segments (there were some abrupt changes of meter that were tricky enough to require Savall to beat time when he wasn’t bowing). A set of consort music from the British age of Queen Elizabeth I and King James I featured the Lacrimal Pavan and The King of Denmark Galliard of John Dowland, an In Nomine à 4 by Orlando Gibbons, and Ein Schottisch Tanz by William Blade. The first three works further developed the theme of instrumental music as arrangements of vocal music, with an ear-catching mix of speeds and modes. The Gibbons sounded the most like pure vocal music, down to its Latin motet title, and was delivered by the four violists, violone, and theorbo. The circle came back to the world of dance music with Blade’s Scottish Dance. Here, Diaz-Latorre laid down another bagpipe-like drone while Savall duetted with Pierlot on alto viol with sharp rhythmic flair. From Britain we moved to early 17th-century France, and the dances start getting arranged in a style like the Baroque suite, in this case with an anonymous Pavane de la petitte Guerre & Galliard, Luigi Rossi’s Fantasie “Les pleurs d’Orphée,” then an anonymous Sarabande “A l’impero d’amore” and Bourée d’Avignonez. The Rossi was particularly striking with its descending bass line, interspersed with cutting dissonant leaps back up the scale. The Bourée unspooled with a gradual, steady acceleration, ending the first half with a virtuosic flourish. After intermission, Hespèrion XXI returned to Venice at the start of the 17th century, with two Canzon compositions by Giuseppe Guami. Canzon 7 “La Cromatica” had the chromatic figure you might expect, exchanged first among the lower strings, then all the strings and theorbo. Canzon 4 “sopra la Battaglia” began with a martial drum roll, then a compound meter ascending figure shared among the strings, with some fiercely articulated duetting between Savall and Duftschmid. Two larger scale pieces from Venice in the mid 17th century followed. Biagio Marini’s Passacaglia à 4 features a recurring bass pattern going through ‘A-A-B-A’ format through some five or six variations and plenty of polyphony for the viols. Giovanni Legrenzi’s Sonata VI à 4 Viole da gamba was the first piece in sonata form. In this case, it was a relatively short work in “church sonata” form in which slow and fast movements alternate, in this case ending with a slow coda. If my report to this point seems mostly lacking in descriptions of individuals, that’s because for the most part, this event really emphasized the group’s collective technical polish. The strings blended beautifully, and passing-tone dissonances and open fifths rang out in the kind of way that only gut strings can. Each violist had some moment in the spotlight with Savall, of which each made the most, though their eyes’ tending to be fixed on the sheet may have diminished spontaneity. The final set of the evening came from Iberia from the end of the 17th century, and here, Hespèrion XXI came through with the kind of verve that marked the folía program that brought down the house at BEMF in 2015 (reviewed here). In the Folía (Obra de 1er Tono, No. 10) by Pedro de San Lorenzo, pizzicatoing viols, and Diaz-Latorre’s guitar within a shorter rhythmic pattern and bass line brought it close to the world of Spanish and Latin American music. The anonymous Canarios and Antonio Valente’s Gallarda featured even simpler recurring bass line motifs which underpinned Savall’s improvisatory flights of fancy. I wonder how much of the music was improvised, though; shortly after Savall reached up beyond the highest playable note on his treble instrument, the group abruptly switched to a minor-key version of the recurring bass line and improvisation, then switched back to major again, as all grinned with some of the more wayward directions. Savall explored the extremes of his range, a variety of rhythmic figurations and dynamics, and at one point even seemed to recall Bach’s harmonization of “Jesu, meine Freude” in his instrumental perambulations. The Latin-inspired music brought the concert to a close, and the audience to its feet with raucous cheers. For an encore, the group offered a Satyrn Dance by William Brade, another spirited romp which hushed down to pianissimo; within pizzicato textures percussionist Mayoral sported an amusing Jew’s harp solo. In sum, the show paid tribute both to Savall’s omnivorous musical research and his ability to recruit a band that functions compellingly of one mind.